This is something of a petty post. But I’ll come right out and admit it: the feelings I have regarding Lane Kiffin and the Vols have been pretty petty ever since they hired a guy with a track record near-identical to Gene Chizik’s and got praised for their bold, high-risk-high-reward, forward-thinking move while Auburn hired the actual Gene Chizik and became a national laughingstock. They only became more petty as Kiffin became an SEC cause celebre for little more than running his mouth and assembling a staff barely more impressive than Chizik’s (if at all) while Chizik and his staff went about their work in (mostly) anonymity*. So yessir, I want Gene Chizik to prove himself a better coach than Lane Kiffin. Yessir, I’ve received a healthy dose of schadenfreude over the news out of Knoxville the past several days. To be fair: on some level I can sympathize with Vol fans who are asking “uh, why us?” over an NCAA investigation into (and Thayer “Jackass” Evans NYT article about) practices that at least sound like the sort of thing that goes on at any serious football school you’d like to name. On the other, though, when you spend the first year of your tenure begging for attention in a manner that the Lohans recently referred to as “shameless,” you can’t really complain when you earn the fruits of that attention, can you? The saddest part, as Orson points out a thousand times more entertainingly than I ever could, is that Kiffin never needed to paint a giant bullseye on himself and his program to accomplish what he needed to accomplish. There’s more goodness (and a much-needed Clay Travis fisk) from TSK. 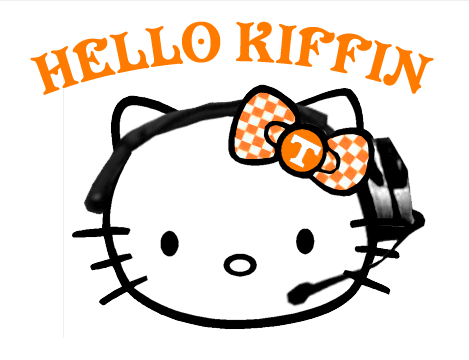 Of course, what’s funny about this NCAA thing is that when all is said and done, it’s probably the second-most damaging bit of news to afflict Kiffykins this month, behind watching both Eddie Gran and Frank Wilson make lateral moves to programs Tennessee regularly recruits against and rumors swirl about the future of The Orgeron. Gran and Wilson have connections to the areas they’ve just moved to, but still: for them to both take new jobs after only a year with Kiffin–jobs that don’t even qualify as promotions–tells me something may be rotten in the state of Denmark. and the other has not. It’s still very, very early, but at this stage I’ll gladly take the first coach, won’t you? *Big Cat Weekend excepted, obviously. And I guess the Limo Gambit. OK, so maybe they were only anonymous when compared to Kiffin and Co. The point’s still valid. People in Tennessee aren’t all that concerned about hostesses or our staff getting cherrypicked. The people who are most concerned are the people who want something more to be there than there is. Like Alabama fans. This is nothing more than some college girls who did something stupid. And you have every right to be happy with your coach, but I hope you’re not under any illusion that we would trade coaches with you. I’m wondering how you’re calling Frank Wilson’s move to LSU lateral… He’s got an offer that was paying him twice as much as he was making at Tennessee. He’s also the recruiting coordinator at LSU, which he wasn’t at Tennessee. I wouldn’t take Kiffin and his staff for the staff we had at the end of bowden’s reign, much less this one. At least we’re seeing results on the field. Those Bill Dance bloopers are great. Thanks! Explain how your on-field resuls were any different than ours. Oskie: I’m not. And like I said, I don’t expect anything to come of the investigation. But you ask me which program looks stronger, more stable today … and I’m sorry, but I don’t think it’s yours. Weller: He’s still a position coach. Maybe it’s not a perfectly “lateral” move–he had reasons, as you point out–but it’s not a big step up along the coaching ladder, either. Let’s calm down now everyone. We’re all going to have to put up with enough crap after Jan. 7. Doesn’t get any better than Bill Dance bloopers. Not to be a smartass, but, “on-field results”? How about “scoreboard”? In UT’s defense, they didn’t lose to UK, and they walloped UGA. In AU’s defense, UT sux, their colors are god awful, and we handily put it to them. That video of Ben Tate running over all-Universe Eric Berry never fails to put a smile on my face. thank you for the clip, btw. Grandaddy gave me tapes of him and these are… priceless. Leave me out of this, please. Too much Christmas shopping to do this weekend and not enough time to devote to deleting screechy Barner comments from folks determined to take this waaaay more seriously than I am. I love it! A beat down, bitter and humiliated TN and one of their fans. After looking forward to the post-Fulmer era, to get it handed to you on national television at home by Gene Chizik and Auburn. Hurts, doesn’t it? If it’s not Alabama beating you down, it’s Auburn! I was looking at our commitment list earlier out of boredom. I couldn’t help but notice that almost every one of our commitments also had offers from Tennessee, yet they chose us. How’s that for keeping score? We win.